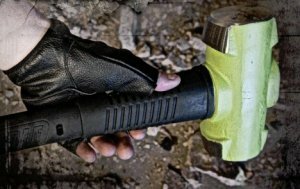 Wilton has introduced a new sledge hammer named BASH that they claim has a handle that is unbreakable. Now I have a hard time thinking that anything is truly unbreakable, and I believe the actual warranty for the BASH will state that the handle is unbreakable under normal conditions, but the fact that they back up their tool's handle with a $1000 guarantee for 2 years, thus putting their money where their mouth is, should add a bit of confidence to anyone purchasing the tool. What makes the BASH handle so much better than the typical wood handle or fiberglass handle? From what I gather examining the photos, besides the handle of the BASH being made of steel, it is actually constructed out of six rods of steel that run the length of the handle. This steel core is then surrounded by a comfortable no-slip grip that is also said to reduce vibrations. I haven't seen what the pricing is like on these hammers, but I think it would be safe to assume that they would be priced out of range for an average homeowner. Though I can't imagine many DIYers going through too many sledge hammer handles. The BASH Sledge Hammer can be purchased in sizes and weights from 12"-2-1/2lb up to 36"-14lb, and you can choose either a Soft Face or Hard Face Head.